A bit more light hearted today. It's about Fiona Exon, from Cumbria in England, who was about to make some scrambled eggs for breakfast. As she cracked open the eggs into a bowl each one was double yolked. Yes, as she broke the full six pack of eggs each was the same. "Erm, so what," you might say, "Is that really a coincidence?" Well sort of. The British Egg Information Service reckons this is extremely rare, a bit like hen's teeth. They say that finding one double yolk egg has odds of just 0.1 per cent (i.e. 1000 to 1). So finding every egg in a standard box of six this way is odds of ... I'm not exactly sure, but one expert mentioned it being 1 trillion to one (providing the eggs were picked at random to fill the box), but this does seem a bit over the top. So what am I trying to say? I guess I'm actually putting a case forward for those who oppose any coincidence as being meaningful. If you can get a pack of six double yolk eggs then any coincidence is also possible somewhere in the world. The thing is though, despite what I've just said, I still believe that some coincidences are meaningful enough to be considered as synchronicity. Yes, there really are messages from the universe to help us along our way. That is, if we can be bothered to consider them properly. Eggs On To Be A Second Coincidence - where the egg plot thickens! Perhaps there was a chicken flock with a genetic propensity for double yolks? The chickens were on fertility drugs? Bob Keller: They were normal run of the mill eggs from a supermarket. 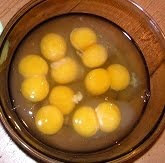 There are though, as you indicate, various reasons why so many double yolks could come about other than chance / coincidence. But at times it's good to not over analyse! curious lassie: The way of the egg is mysterious. You are not alone, others have cracked double-yolkers too - it's nothing to be ashamed about! Six eggs were doubles?? I'd say it's definitely a synchronicity - but meaning what? If it had happened to me, I'd be looking for doubles of things - double the pay, double the books, double everything. Too bad we don't know what was going on in her life! Trish and Rob: 'Meaning what?' That's always the crunch! Yes, I'd be thinking like you. My dad recently had a full dozen double yolk eggs in a box. He didn't open them all at once, so he doesn't have a picture of all them. But he eats two eggs for breakfast everyday, and for almost a week, he had 4 yolks every morning. Ryan: That's amazing! Wonder what the odds are of that happening.